Style: Marzen-Style Festbier ABV: 5.8% Availability: Seasonal A Märzen that is true to German tradition, it is only brewed once a year to celebrate the fall harvest. The perfect balance of Pale, Munich, and Vienna malts create its toasty backbone. Prost! In 1984, this was the first wheat beer made in the U.S. after Prohibition, and in 2001 we re-introduced this favorite as an unfiltered Hefeweizen. A slight citric tang and banana aroma make this the perfect beer for working on your lederhosen tan lines. ABV: 7.56% Style: Speciale Belge Availability: Winter Seasonal As every Midwesterner knows, no two snowstorms are ever alike. This year’s rendition is moderately malty with notes of biscuit and a subtle fruitiness. Believe it or not, there once was a time where beer and lemonade hadn’t been united in perfect harmony. Enter the Radler. A perfect 50/50 blend of beer and grapefruit soda makes for a light and crisp lager that is sure to shock your senses. Pale straw in color with a mild maltiness and slight hop aroma, Schell’s Light is a perfect option for the drinker who is looking for a robust flavor without all the calories. Named after part of historic New Ulm, Goosetown is golden-orange with a thick, white foam head. Its light and citrusy tartness is backed by a bready malt character and complemented with coriander spice. Let loose with a ‘goose’! 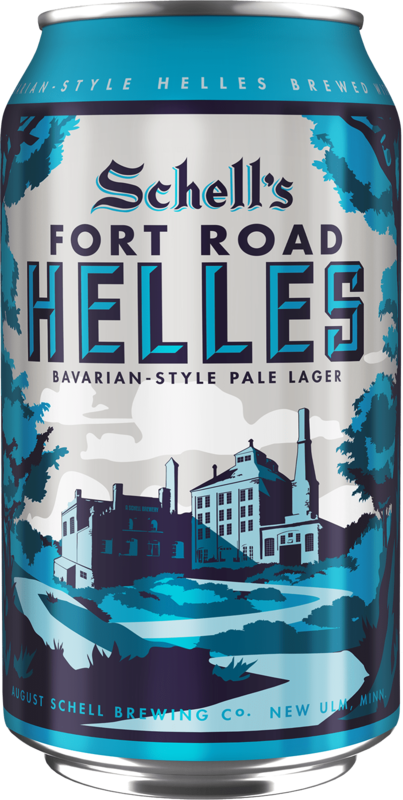 Brewed to allow the bready character of the malt to shine through, Fort Road Helles is a full-flavored and easy-drinking classic. Schell’s Firebrick, a refreshing Vienna-style amber lager, is named after the bricks that line the old boilers. It has a hint of hops combined with a subtly maltiness that creates a mild, pleasantly drinkable beer. Inspired by our roots in the days before refrigeration, our Cave-Aged Barrel-Aged lager is released each fall after spending time aging in the historic caves deep below our brewery. High in alcohol content with hints of sweet caramel, oak, and vanilla. A rich malt body accented by a refreshing hop tang. A true European-style Pilsner beer that stands tall against its lighter-bodied, low-hopped relatives.